I believe there is some uncertainty as to the CDV of the unidentified 23rd PA soldier shown above. In 1862, there was a Zouave company in Lancaster known as the Lancaster Zouaves (formerly First City Zouaves and eventually renamed to Schaeffer Zouaves), led by Capt. William Duncan. In August 1862, it merged with Company K of the 122nd PA which formed in August 1862. 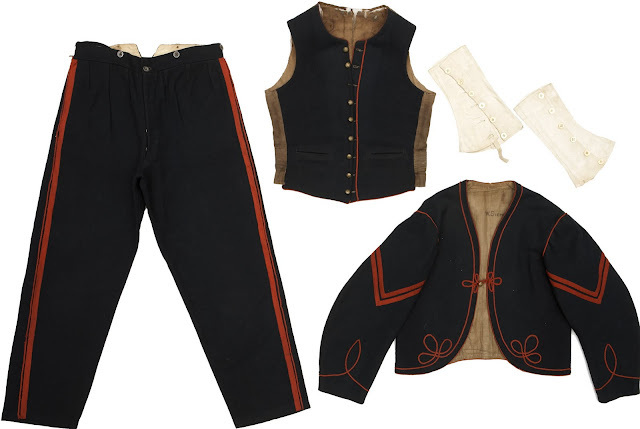 In the Constitution and By-Laws of the Lancaster Zouaves, it states that the uniform "shall consist of blue Zouave pants, jacket and shirt, with red trimmings, leggings, and blue caps." I believe this description accurately describes the uniform worn by the unidentified 23rd PA soldier in the CDV above. However, they may not have retained this uniform when they merged with Company K of the 122nd PA. Certainly, the image of Cpl William Schaum (in the Duke University Special Collections) shows a different uniform; however, I only find his brother Henry listed in the Lancaster Zouave records. Very interesting! I forgot about the other zouaves in Lancaster, and really haven't researched any of the units you mentioned in any detail. Perhaps investigating when Stehman and Eberman were in business could help make a guess. Thanks for the comment, Brian. That CDV is definitely a 23rd PA Zouave. As for the 122nd PA's Lancaster Zouaves, they wore copies of the 5th NY Zouave uniform, paid for by Schaeffer, which consisted of blue jackets with baggy red pantaloons. Thanks for your input, Shaun. 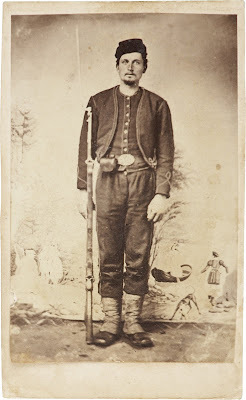 I'm not sure what your source was for the info about the Lancaster Zouaves, but curiosity led to a quick Google search that pulled up a record from the James S. Schoff Civil War Collection at the University of Michigan, which includes the company's records and confirms your info about the uniforms.